For the first time in their history, the Houston Astros are World Series champions. They defeated the Los Angeles Dodgers 5-1 in Game 7 to win an exciting World Series 4-3. It was an emotional World Series. Naturally, it produced some standout performances of both the good and bad variety. So, who are those people? Naturally, in one of the most hitter-friendly World Series of all-time, plenty of Astros hitters are winners. Just as naturally, plenty of Dodgers’ hitters are losers. But one Houston pitcher did stand out in a good way, while a well known Los Angeles hitter stood out in the other direction. These were the winners and losers from the 2017 World Series. 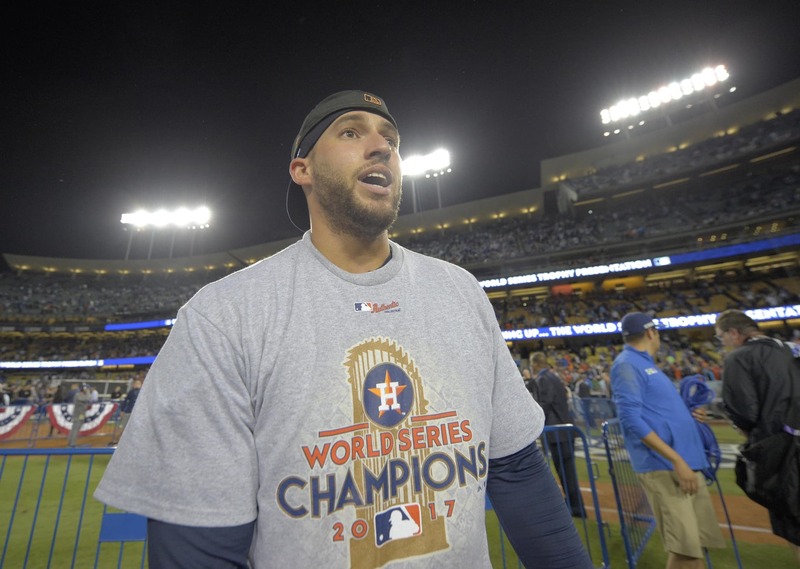 Springer had struggled in the American League playoffs and frankly, the Astros were not going to beat the Dodgers without the lead-off hitter stepping his game up. Fortunately for Houston, Springer did just that. Springer set the table well by hitting .379 for the World Series with a .471 OBP. But he also did his own damage with five home runs, tying Reggie Jackson and Chase Utley for the record in a single World Series. It wasn’t only a dramatic turnaround from a subpar American League playoffs. In a series where offensive records fell by the wayside, Springer was not only the MVP, but was a clear choice for MVP. Darvish was acquired from the Texas Rangers to pitch in these spots. He was someone who could compliment Clayton Kershaw in the rotation. The Dodgers, who clinched the NL pennant early enough, could have set their rotation however they wanted. So, giving Darvish the Game 3 (and in turn Game 7) start was not done out of necessity. It was a choice. It was a choice that backfired in a big way. That all works out to a 21.60 ERA and a 3.30 WHIP. Obviously, that’s not close to being good enough. Off of the field, Darvish was thrust into an awkward situation involving a slanted eyed gesture made towards him by Houston first baseman Yuli Gurriel. Darvish couldn’t have handled that much better. Unfortunately for Los Angeles, Darvish couldn’t have been a whole lot worse on the mound. Bregman finished the series at .233/.274/.467. While that may not look especially wonderful, it also doesn’t show the overall impact that he made. The Houston third baseman hit two home runs and drove in five. One of those five was the walk-off hit to end the back-and-forth Game 5, putting the Astros up 3-2 in the series. As if all of that wasn’t enough, Bregman played an absolutely beautiful third base for Houston, picking up right where he left off in the ALCS. Even if the overall numbers were not much to write home about, Bregman’s performance in he 2017 World Series was nothing short of fanastic. It’s tough to put Kershaw in this group. He was masterful in a Game 1 win and his relief appearance in Game 7 did a lot to give the Dodgers a chance. They didn’t take advantage of that chance, but that’s not something that can be pinned on Kershaw. But the Los Angeles ace does deserve ample blame for Game 5. Because the game was so crazy, it’s easy to forget this now. But Game 5 couldn’t have started any better for the Dodgers (or worse for the Astros). Kershaw — who had dominated Game 1 — was given a 3-0 lead before throwing his first pitch and was up 4-0 before coming out in the fourth. When the fourth ended, the game was tied at four. Los Angeles then gave its ace new life, with a three-run inning in the top of the fifth. That lead lasted one-half inning. Houston scored three in its half of the fifth, with two coming off of Kershaw. In a series like this, it’s easy to look back at the close games and wonder why those games went the way that they did. In 2017, the two swing games were Game 2 and Game 5. Both went the Astros’ way. Game 2 had nothing to do with Kershaw. We can’t say the same about Game 5. Kershaw is the best pitcher of this generation and a surefire Hall of Famer. When someone that good gets the kind of support that Kershaw got in Game 5, he has to deliver a win. Kershaw didn’t do that. Like Darvish, it’s important to note that we’re focusing strictly on what happened on the field with Gurriel. Houston’s first baseman was similar to Bregman in that his overall offensive numbers don’t look too spectacular. But he came through with some big moments. After the Astros split the first two games, Gurriel got the party started in Game 3 with a home run against Darvish. Then, after the Dodgers built the aforementioned 4-0 lead against Houston in Game 5, Gurriel was the man who hit the home run against Kershaw to tie it at four. Gurriel finished the series at .214/.241/.536. Aside from the slugging percentage, that’s not a particularly attractive slash line. But he came through in some very big situations for his team. It’s awfully hard to imagine the Astros winning this World Series without Gurriel’s contributions. Jansen finished the series with a 3.12 ERA and a 0.84 WHIP. On the surface, the numbers look fine. But when it came to when he allowed those runs, Jansen’s timing was terrible. It started in Game 2. Jansen allowed a run in the eighth, but still took the mound in the ninth nursing a 3-2 lead. Had he held that lead, Los Angeles would have gone up 2-0 and quite frankly, it’s hard to imagine the Dodgers blowing that lead. It didn’t work out that way. Then, Jansen retired Evan Gattis and Marwin Gonzalez in the bottom of the 10th inning in Game 5. But he responded by hitting Brian McCann with a pitch, walking Springer, and then allowing the winning hit to Bregman. The Dodgers lost four games in the 2017 World Series. Jansen blew a save in one and took the loss in the other. Even if his other outings went well, those struggles can’t be overlooked. Morton wasn’t spectacular in his Game 4 start. But he was extraordinary in Game 7 of the World Series in relief. Morton took the ball in the sixth inning and finished the game. He allowed the only run that Los Angeles scored, but went four innings and allowed only two hits with four strikeouts. Additionally, while a 5-1 final may suggest a rather lopsided game, the Dodgers had opportunities in nearly every inning early on. But after Morton pitched through trouble in the sixth, he was perfect over the final three innings. Bellinger is a player with a lot of talent. He’s going to go on to great things in baseball. But his performance in the 2017 World Series was rough. He did hit a home run, but slashed at .143/.173/.393. He also struck out 17 times, including three times in the decisive Game 7. You can deal with that if the guy is hitting for more power. But those numbers and only one long ball are just not going to get the job done. Many Dodgers struggled at the plate. But none stood out quite like Bellinger. For the sake of Bellinger and his team, just hope that the 2017 World Series will serve as a learning experience. Entering the World Series, the battle of the bullpens was shaping up like Ronald Reagan against Walter Mondale in 1984. It was a battle, but it seemed like a horribly one-sided one. How would the Astros overcome this? Part of that came from the Astros getting to the Dodgers’ bullpen. That’s not something that the Arizona Diamondbacks or Chicago Cubs could do. But Hinch managed his bullpen beautifully . When Ken Giles was struggling, he was benched. When Morton was going strong in Game 7, he was allowed to finish the game. Hinch went away from the guidebook. He rode the hot hands and stayed away from the cold ones. That was a major turning point in the World Series and helped tilt it in Houston’s favor.